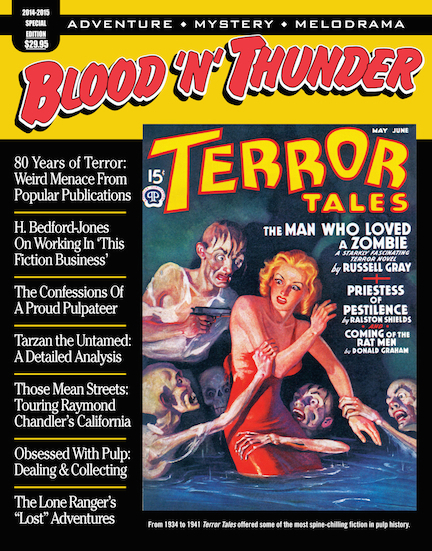 As these words are being written, copies of the new Blood ‘n’ Thunder have been sent to all current subscribers. There are quite a few renewals outstanding, which is hardly surprising. Since it had been nine months between issues prior to the release last month of the 2014-15 Special Edition (comprising numbers 42, 43 and 44), I can easily understand some of you thinking I’d pulled the plug on BnT. Additionally, last year’s subscriber-database meltdown contributed to the confusion when approximately 30 subscribers were inadvertently dropped from the list and therefore did not receive the Summer 2014 issue. But BnT is still very much alive and now back in business. Beginning today and going through May 31, those subscribing to BnT for the first time will be eligible for a 20-percent discount on any and all currently available Murania Press publications. Please note that the offer extends only to books and magazines listed on this site as of May 1 and does not apply to future releases. To qualify for the discount, newbies must first subscribe here. Then, having picked out the publications they wish to purchase at the 20-percent discount, they should e-mail Kevin C. at muraniapress@yahoo.com and list the books wanted. At that point he will generate an invoice for the discounted items and send it to the buyer. We will accept Paypal payment for these purchases, just as we do normally. To be clear, this deal is for first-time subscribers only. The new Murania Press releases got a warm reception at last month’s Windy City Pulp and Paper Convention: I came home without a single copy of either the BnT Special Edition or The Island, volume five in the Classic Pulp Reprints series. And post-show orders for each have been brisk. I’m already working on the Summer 2015 issue of BnT (#45) and will be teasing it soon as the contents are mostly set. The next entry in Classic Pulp Reprints, William Corcoran’s 1933 thriller The Purple Eye, could be ready as soon as June 1. Keep watching this space for further announcements!